The current research tool du jour in the field of neuroscience and psychology is the fMRI, or functional magnetic resonance imaging. It’s basically the same as the MRI machine found in any well equipped hospital, but with a key difference: it can detect very small variances in the blood oxygen levels, and thus areas of activity in the brain. Why is this important? For researchers, finding out what area of the brain is active in response to certain stimuli is a ticket to Tenure Town with stops at Publicationton and Grantville. fMRI labs are expensive, and [Jeremy]’s submission to The Hackaday Prize is aiming to do the same thing much more cheaply, and in a way that will vastly increase the amount of research being done with this technique. How is he doing this? Using the same technology used in high-tech vein finders: infrared light. [Jeremy]’s idea is much the same as a photoplethysmograph, better known as a pulse oximeter. Instead of relatively common LEDs, [Jeremy] is using near infrared LEDs, guided by a few papers from Cornell and Drexel that demonstrate this technique can be used to see blood oxygen concentrations in the brain. Being based on light, this device does not penetrate deeply into the brain. For many use cases, this is fine: the motor cortex is right next to your skull, stretching from ear to ear, vision is taken care of at the back of your head, and memories are right up against your forehead. Being able to scan these areas noninvasively with a device you can wear has incredible applications from having amputees control prosthetics to controlling video game characters by just thinking about it. [Jeremy]’s device is small, about the size of a cellphone, and uses an array of LEDs and photodiodes to assemble an image of what’s going on inside someone’s head. The image will be somewhat crude, have low resolution, and will not cover the entire brain like an fMRI can. It also doesn’t cost millions of dollars, making this one of the most scientifically disruptive entries we have for The Hackaday Prize. You can check out [Jeremy]’s intro video below. This is a cool idea, but is a bit misguided. The imaging technique proposed will not penetrate the skull, so it will not be capable of imaging blood flow in the brain, it will however possibly measure blood flow in the scalp. …but it apparently works. If you do some research on “transcranial infrared stimulation” – you’ll find plenty more references. If you can stimulate the brain using IR wavelengths, then it should be possible to monitor reflected amounts of light at the same time (the question would be whether it is possible to do so using non-focused low-power sources, which may be what you are referring to). If only half the photons get in, only a quarter will get out. Would prior CT scan or normal MRI scan showing brain anatomy be able to increase precision of your fNIR image? As I understand it, whenever you do a brain MRI the data gathered is *projected* onto a *sample brain*. There are a few different *brain averages* that are used for this. Jülich and MNI are commonly used. This *sample brain* is an average (sometimes with statistical weighting) of other subjects’ brain structures. This is the only way to *know* what areas are being looked at. NIRS has been around for a while, and isn’t anything new. Its only real Advantage is cost/cost of Operation vs. an MRI. What sample brain projection in an mri? When you do any if the protocols for brain imaging and place phantom you can test uniformity if it was projected onto a some statistical brain the phantom image would be altered by the overlay. Maybe in fNIR that’s the case but certainly not in standard MRI brain imaging. I don’t think this method us a viable method for controlling anything like you suggest in the article. This detects active areas by detecting blood flow, which will likely have appreciable lag and lack precision for such an application (not the device, but the blood flow in the brain itself). That was something that popped out at me as I read the project; I would have to agree. But as an experimental and possibly diagnostic tool – this is a pretty interesting project! I did a little fMRI and EEG in grad school, and the lab around the corner had a commercial fNIR system that they’d just purchased. The central difference in these techniques is that fMRI can give very good spatial (~mm scale) resolution of active brain regions, but the blood-oxygenation level dependent (BOLD) signal has a ramp up of about 8 seconds, so it has a very low temporal resolution. EEG is the counterpoint to this, a cap with 64 electrodes still has relatively poor spatial resolution, but a temporal resolution on the order of a millisecond — so about 10,000 times faster than an fMRI, so there are lots of cases where it’s very useful. fNIR is the low-cost version of both, and has both low spatial resolution, low spatial coverage, and (using the BOLD signal) very low temporal resolution. It’s largely a cost/benefit issue: for the subset of behavioral/neuroscience studies that can be done with fNIR, the system costs are in the thousands (I think), where as a research grade EEG is ~50k-100k, and an MRI is ~1M. Could a combination of this and a DIY eeg ( http://openeeg.sourceforge.net/buildeeg/ ) be used to increase its usefulness? That kind of lag is quite acceptable for uses like adjusting your smartphone’s music player to your current activity. For example: classical to help you concentrate while sitting to work with your hands, fast and upbeat electronica when you go for a run, and metal to drown out all the noise on the subway (sitting, not using hands, often with eyes closed). There was an experiment where they told subjects to press a button ONCE when they saw say a green light come on. Then they probed the brain until they found the place on the motor cortex where the “press button” was initiated. So next they made the feedback: “You’ve pressed the button” act not on the button press but on the motor cortex giving the command. With an “about 100ms” delay, everybody was happy. With a zero-delay people see the feedback before they expect it (the signal has not had the time for the muscles to activate), and they are afraid they will press the button again when the muscles finally react (100ms later). So… say a 100ms lag is entirely acceptable. I’m typing this at around an average of 200ms between keypresses, while simply compensating in my wet-ware for that delay….. No problem. So.. my guess is that a 150 ms delay will be entirely acceptable, maybe even 200ms will still feel as instantaneous to the user after a while. how is this different than NIRS imaging? How can this be considered his idea ? This kind of technique has been described in 1977 and implementations exists for almost 20 years now ! Cheap portable and multichannel systems already exists, some of them combining fNIR and EEG. Because that one is commercial, and this one will be open source and probably 1/10th the price? You could use that argument for about 3/4 of the hacks that show up on HaD. It’s not about inventing something new, it’s about bringing something to the masses. imagine you are a patient, do you really want to scan your brain with a home made hacked device? this will never have any success. I’ve been a patient. The costs of sending someone through an expensive procedure is weighted against the gains that it will bring. For example sometimes the doctor will diagnose: “your leg is not broken” without the X-ray (*). If the costs of making a (less accurate) scan drop a lot, some cases will warrant a “low cost” scan as opposed to the “I don’t expect any new information from the expensive scan, so I will base my diagnosis on the facts without the scan”. That said. The goal is not to brain-scan sick patients for brain cancers using a home-made version of this machine. The goal is to do research on brain functions in healthy patients. Moreover, with the cost of this “scanner” being (I’m guessing) below $100, hobbyists can join in that research if they want to. Also funding-challenged PHD students can use these techniques. Also there are several separate advantages to this technique as opposed to FMRI for example. According to one of the linked articles (or did I get the link from a comment?) NIRS (as they call it) has worse spacial resolution than FMRI, but better temporal resolution and is less “bothersome”. As to that last point: To do MRI (including FMRI) you need to stick your head into a big magnet. Leaving only a few cm (inches) of movement. 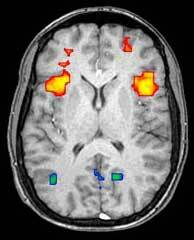 So research using fMRI is restricted to showing pictures and letting the person press one or two buttons. With the IR technique, you can let someone walk around with a helmet-like sensor on their head and let them participate in “interesting” activities. (*) The “cost” for an X-ray is not only the expenses for making the X-ray, but also the risk of complications due to the radiation exposure. Grr. Wrote “patients” where I should’ve written “subjects” once. Sorry. don’t know in what 3rd world country you live in to have such a bad healtcare. probably ameritardia. in developed countries you have a thing called human rights that cover health. so you don’t have to pay for it. that means if you are poor you actually get treated and don’t die. no way a doctor here would say such a thing without a proper x ray. even if he is 100% sure that the leg is broken he will for sure in all cases sent the patience to an x-ray to confirm and/or to see if there’s other issues etc. human error is a very serious problem. also you might not know this but medics don’t have x ray vision. they actually require an x ray machine to see it. in fact if the doctor doesn’t sent the patient to a x ray he could be expelled and his license revoked an be criminally charged. Again, this is completely worthless. there’s a reason why this things cost a ton. they have to be incredibly precise and calibrated and maintained and certified. you don’t play with your health. Not only it’s incredibly dangerous for that reason but this might inspire some morons to build other devices for x ray and other things. you really don’t want to play with radioactivity and extremely strong electromagnets. this is a very very very very very very […] very very bad idea. it’s irresponsible for hackaday to feature this pseudo hack. Um, Pedro? I don’t know if you realize, but we live in a world where a teenager can build a fusion reactor from plans found on the internet. (For example: http://www.telegraph.co.uk/science/science-news/10679744/British-schoolboy-13-becomes-youngest-to-build-nuclear-fusion-reactor.html ) Keeping people ignorant is not an effective way to promote safe handling of radiation. The only way to do that is to educate the general public, so it becomes as common-sense as checking for traffic before you cross the road.